Welcome back to the Alabama Largest Old School Party originated in Tuscaloosa Alabama. If you a music lover from the 80's 90's & 00's this is the place to be. Strictly for the Grown Folks. 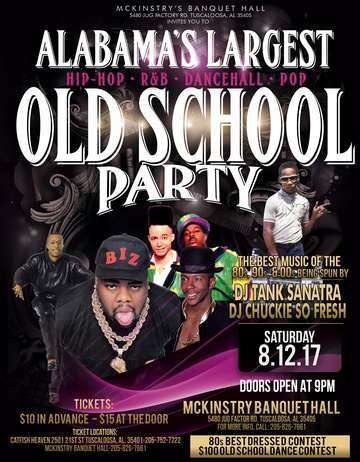 In our quarterly efforts to give the Adults of Alabama a place to mingle, dance and have fun we invite you to a night in your past of Old School Music. McKinstry Banquet Hall offers one of Tuscaloosa safest, clean adult fun loving atmosphere's. With Tuscaloosa's Westside Dj's Chuckie So Fresh & Dj Tank Sinatra playing true sounds of the 80's 90's & 00's. Get your Tickets and don't miss out.